I’ve been thinking about shoes, as we prepare to shoot the first episode of season one, which is about caring for your footwear. Judging by your questions, there are lots of PTO readers who want some basic information about choosing quality shoes. Today, let’s talk a bit about leather. First of all: don’t buy dress shoes that aren’t made of leather. Perhaps that’s obvious, but I will say it anyway, just in case. I understand that some folks are vegetarian or vegan, and don’t wear leather, and I respect that completely. All I can suggest to those people is maybe to consider whether their ethics will accommodate used leather shoes. 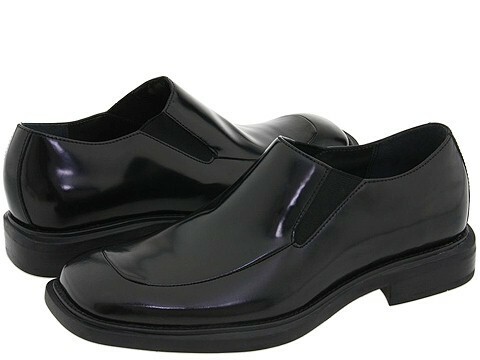 Men’s dress shoes are made of leather because leather is a fantastic material to make shoes from, and plastic is not. That said, just because you’ve bought some leather shoes doesn’t mean you’re getting the good stuff. If you walk into the men’s shoe section of JC Penney’s today, you’ll generally find shoes made of leather. But not the good stuff. Like the Kenneth Cole shoes pictured above, they’re made of what’s called “corrected grain” or sometimes “polished” leather. What is corrected grain leather? Well, most animal hides are imperfect. They have marks, scars, imperfections that make them unsuitable for use in shoes. You wouldn’t, after all, buy a shoe with a big scar on it. There are plenty of applications for leather which don’t require a perfect surface, but shoes do. So rather than use only the best portions of the hide for shoemaking, manufacturers literally sand off the surface of the hide. Then they build a new, chemical surface on top. The result looks like the (hideous) Kenneth Coles pictured above. It’s leather, but the finish is, for lack of a better adjective, plastic-y. It has an unnatural shine, and there is either no grain or, sometimes, an embossed grain. Like when people make fake alligator handbags. This works out fine for the cheap manufacturer, as the shoe looks good in the store to a consumer who’s just looking for “shiny leather,” but the disadvantages are numerous. Besides the tacky finish, corrected grain creases more severely (because of the added layer of plastic-y chemicals on top of the leather), breathes more poorly, and ages badly, as the finish can be damaged or can even flake off of the leather below. If you go to a thrift store, you’ll find many cheap Bostonian dress shoes with a finish that’s literally peeling off the shoe. So, in short, avoid corrected grain. Instead, look for shoes made of full-grain leather. Spend some time looking at a quality shoe in a nice department store – say an Alden shoe in Nordstrom. Notice that the surface feels like leather, not like enamel. Notice the depth of the color. It’s not too tough to tell the difference between full grain and corrected grain if you get a little practice under your belt. Generally quality manufacturers are (justifiably) proud of the materials they use – a good shoe salesperson will be familiar with the difference. Language like “full-grain calf” is what you’re looking for, and “polished calf” is what you’re trying to avoid. A well-made pair of full-grain leather shoes will last through half a dozen resolings and twenty years of wear. There’s one more type of shoe leather you should be aware of: shell cordovan. Unlike most shoe leather, made from cow hides, shell cordovan is made from horse hides. Specifically from the thickest part of the horse hide, the rump. Shell cordovan shoes are expensive, because relatively few horse hides are processed for shoe leather, but they have several advantages over calf. Shell cordovan is relatively thick and extremely durable. It’s more weather-resistant than calf. It also doesn’t crease in the way calf does. The stress points in shell cordovan shoes don’t look like a little network of rivers, but rather like a few rolling hills. Of course, the scarcity and quality of shell means that new shell cordovan shoes tend to sell for upwards of $500. Because shell cordovan shoes last so well, they’re possible to find used. Manufacturers like Florsheim, Nettleton and Alden used them for traditional shoes for many years. You’d do well to look at some pictures of worn shell cordovan shoes so you can recognize the material should you run across it in a thrift store. Leather is the essential building block of every shoe. If you want footwear that can live with you for the next twenty years, get the good stuff.